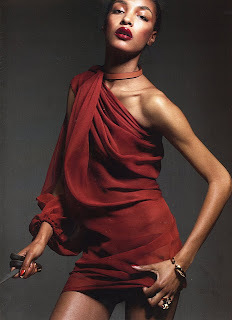 Jourdan Dunn illuminates the pages of Numero issue 124 in a luxe editorial lensed by Liz Collins. Dunn possesses an elegance, worldliness and refinement that places her in a league of her own and is one of my favourite faces amongst the current generation of models. 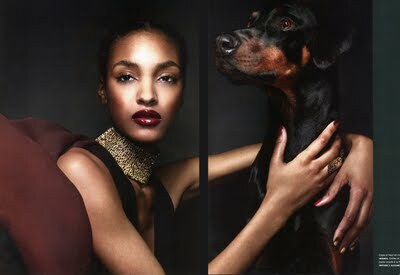 Collins captures Dunn's luminous beauty as she poses alongside an equally majestic looking Doberman. 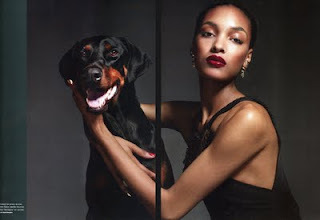 Returning recently to modelling following the birth of her son Riley, Dunn has managed to retain her blue chip appeal with appearances in US Vogue, British Vogue, Vogue Italia, i-D Magazine and V Magazine in this year alone. 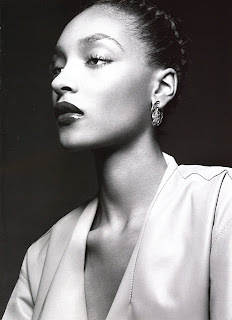 Dunn most recently landed back-to-back campaigns for Burberry shot by Mario Testino. With Dunn appearing alongside Daphne Groeneveld in the Spring/Summer 2011 Prada Fantasy Lookbook, the rumour-mill has it that Dunn could well be making the move from runway to front of house at Prada.